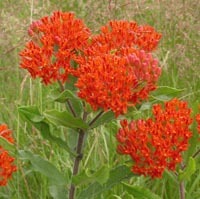 Butterfly weed, Asclepias tuberosa. Photo by Kris Henricksen, click to enlarge. -- Henry David Thoreau, as quoted in a recent conversation with Willam Moomaw, in regard to the Moomaw's approach to conservation and life. Tuesday, June 26, 10:00 am to noon. Wednesday mornings at Native Earth are Toddler Time, where toddlers and their adults can meet and play in a fun and unfettered environment. For more info call 508-645-3304 or see website. Wednesday, June 27, 5:30 pm, at the Chilmark Library. From tinctures to ease tummy aches to elixirs to enhance energy, making your own remedies from easy-to-find herbs can be a satisfying and pleasurable way to connect with nature and your family's health. Join herbalist Holly Bellebuono for a discussion of her new book (pictured above). Free. Please call 508-645-3360 for more information. Thursday, June 28, 5:00 pm, at the Chilmark Library. Aquaculture experts Dr. Elizabeth Fairchild, Brett Stearns, and Warren Doty will provide an update on the flounder stock enhancement program. The New England winter flounder population has declined 91% in the past 20 years. 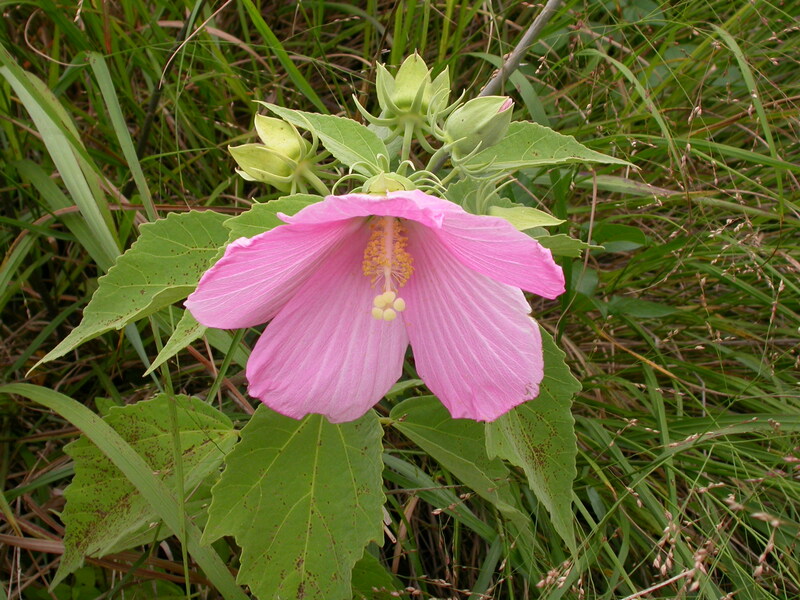 Dr. Fairchild's research is looking at reasons for the decline and possible programs for restoration. Free. Please call 508-645-3360 for more information. Reserve your space now for the seventh year of summer programs at Katama Farm. Programs for kids of all ages, 2 - 17. Sign up online or call 508-627-7007. 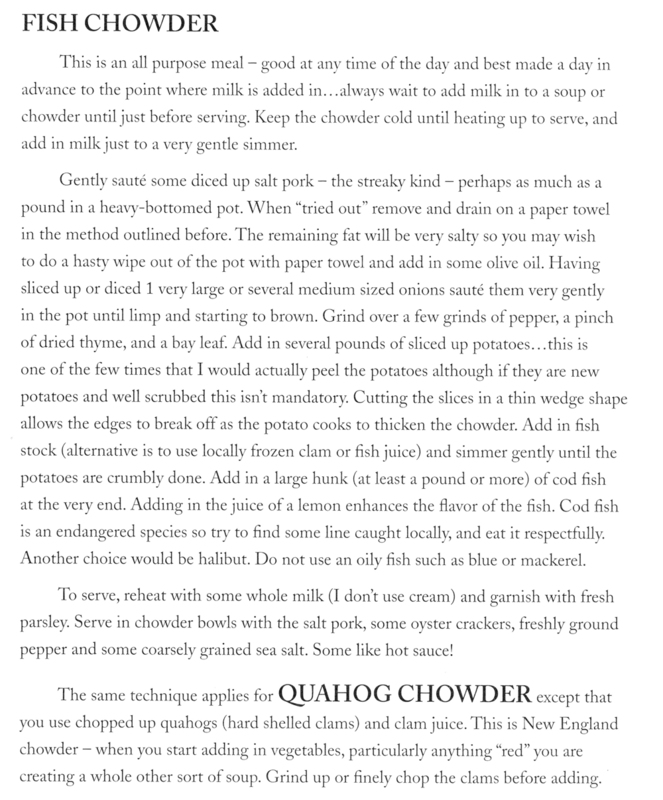 This week we return to Ginny Jones' cookbook, Fresh from the Vineyard, for an Island staple, New England-style chowder. Pick up some fresh milk from Mermaid Farm or the Grey Barn and a white, firm (but not oily) fish from your local fish market, and enjoy making your own version of this classic, all-purpose dish. Fresh from the Vineyard, by Virginia Jones, features recipes that take advantage of our bounty of local produce, meats, and seafood. You can find the book at many Island stores and farms, including Bunch of Grapes, Cronig's, Larsen's Fish Market, Allen Farm, Morning Glory Farm, Mermaid Farm, Nip N' Tuck Farm, and Fiddlehead Farm Stand. Proceeds from sales of the book will benefit both VCS and the Island Grown Initiative. And if you’re not yet a member, there’s no better time to join! 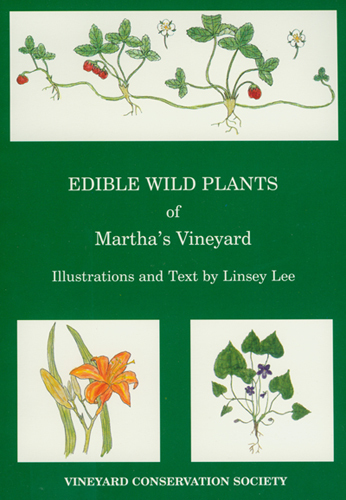 Back in stock after a year's absence, new members can choose to receive a free copy of Edible Wild Plants of Martha's Vineyard by Linsey Lee. This beautifully illustrated guide to our wild bounty of edible plants includes descriptions of plants and their habitats, with fascinating information about traditional medicinal and folklore uses. 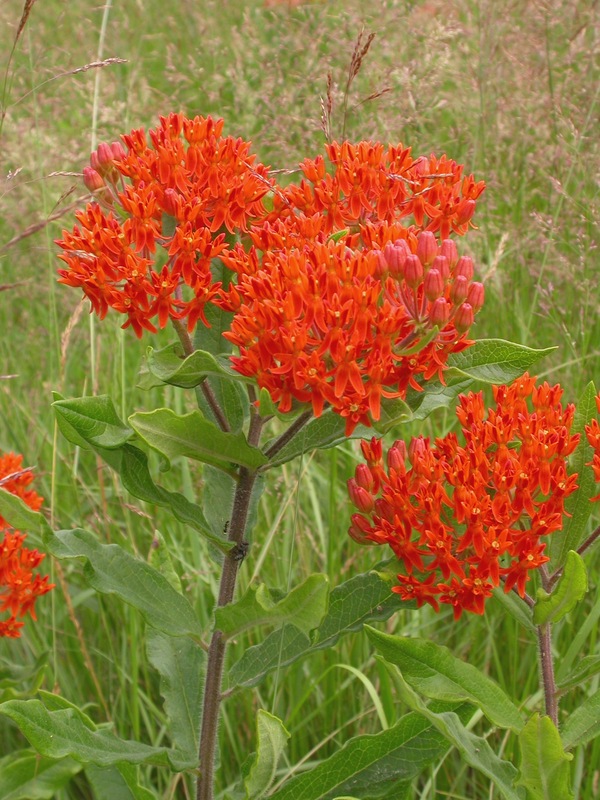 Willam and Margot Moomaw speak on climate change and green living at The Grange on July 9. For the last several years, VCS has made climate change awareness and education an organizational priority. This summer, we are proud to host renowned environmentalists William and Margot Moomaw for a very special presentation. The Moomaws will offer insight into both the global context of one of the most pressing issues of our time and the possibilities and benefits of taking action locally to live deliberately and live better. Please join us on Monday, July 9 at 5:00 pm at the Grange Hall for this free event. The Moomaws are hoping for an interactive, community forum style of presentation, so bring questions and speak up! Another Assault on Island Oaks: The Gall! At the risk of being accused of sympathizing with the enemy, it is hard not to marvel at the ingenuity of these tree parasites. Female gall wasps lay their eggs inside the tree, whereupon hatching the larvae takes control of the tree’s growth, turning its resources to the growing wasp’s benefit. The tree builds a hard shell around the wasp, which not only protects it from predators (though not all predators: other equally dastardly wasps have adaptations just for piercing galls and injecting their own eggs into the bodies of the gall wasp larvae living inside), but also serves as the food source for the growing larvae. Further, the diversity is amazing. There appears to be at least one wasp species to parasitize nearly every species of oak, and most of their body parts as well, with different specialists for leaves, stems, buds, and roots, all creating distinct galls. Small-scale wind turbines for private electricity production are gaining in popularity, and for good reason. Windmills on residential and agricultural land offer a source of clean, renewable energy and substantial cost savings, especially as carbon-based energy prices rise in the future. Further, in a world where most actions to combat climate change involve national and international politics, for which the odds of affecting change can at times seem dismayingly long, it is something individuals can do (along with efficiency improvements and conservation) to lower their personal carbon footprint. However, a recent proposal in Falmouth would mandate that this be the only form of wind power allowed in town, which seems misguided. Under the new bylaw, turbines would be limited by their power output, not to exceed 200 kilowatts. Rather than focus on the noise, or visual impact (i.e. height) of turbines, things that are actual downsides to wind power, by directly limiting the power output this measure penalizes more efficient production of clean energy. Isn’t that the whole point of a wind turbine in the first place? And on the other hand, a big, loud, and ugly windmill would be acceptable, so long as it doesn't actually generate much electricity? Another condition of the proposed bylaw, much the same spirit, is that the primary purpose of a turbine must be to provide power for the property on which it sits, not to sell to the general grid. It’s nice to imagine a little windmill for every home in America providing total energy self-reliance; further, this approach might even work in rural communities (like our Up-Island towns and Chappy). However, it’s unrealistic even at the modest population density of Falmouth, and an obviously unworkable approach to solving the global energy crisis, in light of the fact that the vast majority of electricity is consumed by heavy industry and in cities. That would take one large windmill atop a 500-unit Bronx apartment building! You don’t have to take a position for or against wind power in general to know when a certain proposed compromise is nonsensical. If Falmouth residents don’t want to look at (or hear) large turbines, then ban wind altogether and institute significant conservation and efficiency programs. Further, install photovoltaic panels on the roof of every municipal building in town, and offer incentives to homeowners to do the same. That would do more to reduce energy usage than a sprinkling of quaint little windmills.